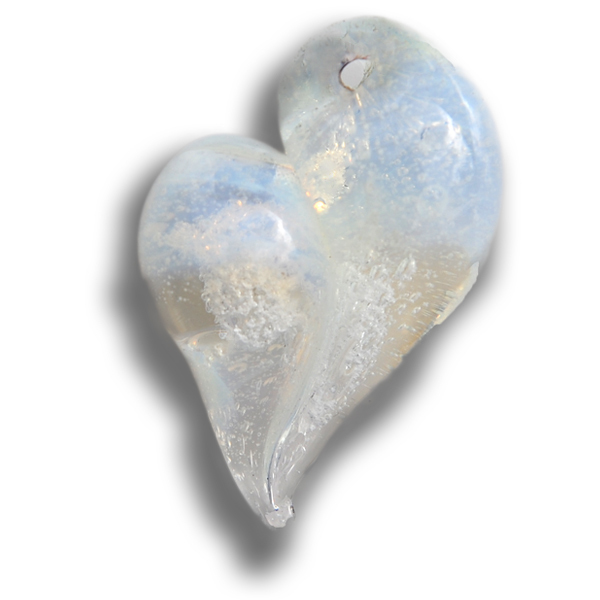 Description: Misty White is a beautiful, and delicate translucent white with an opalescent sheen, while interwoven with your loved one’s cremains/ash.This Cremation Keepsake Pendant is in our classic Heart design made from optical clear Pyrex glass. A soldered Sterling Silver Jump Ring will be added for security. Once completed, I will sign the loved one’s name, or pets name, or term of endearment e.g. Dad, Mom, etc. on the back of the keepsake in 22k gold, so as to be Forever in Glass.